"Drive for show, putt for dough". Practice your golf game using the Upstreet indoor putting green cup. Why do so many golfers cringe when they step on the green? Many have the best drive and short game of their lives but when it is clutch time, they lack the confidence, skill, and practice that comes with the one club many find intolerable; a putter. Many golfers agonize over their putter than any other club. The putter is the one club that requires the finesse. It is the club that can edge out your competition with one smooth stroke, or it can send you down the worst rabbit whole and make a meal of you in seconds. To become a confident golfer, one who is not afraid of the putting green, you must spend time practicing. 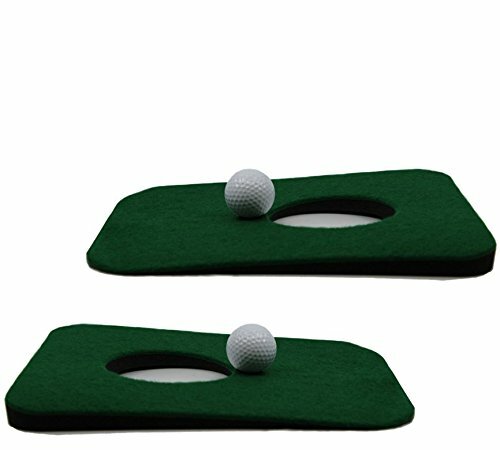 Upstreet has made it easy to putt with the perineum indoor golf mats. The Indoor golf mat is a must-have when it comes to increasing confidence and muscle memory for your putting game. This easy to carry set comes with two mats and two practice balls. Take it to the office, use it at home, or bring it with you on a vacation. Your putting game will never be the same again. ⛳ - Practice your putting skills at the office or play putt putt at home with the kids. Golf training no longer is exclusive to the outdoor golf course. ⛳ - Our one-of-a-kind putting green surfaces are made of quality polyurethane - giving a genuine green feel. Best of all, our indoor putting surface is cut very thin on the most front portion of the mat, offering a smooth golf ball transition from carpet to hole approach. ⛳ - Simulating your golf putts at the office is fun leisure activity as you relax and stay loose. Putting green mat was designed to be sleek, lightweight, and easy storage. ⛳ - Golf turf is difficult to simulate, after months of trial and error, we've struck the optimal putting surface. Not only is our miniature indoor putting mats look professional and clean, but it's amazingly sturdy and lightweight. ⛳ - A mini golf surface helps familiarize guests to the activity you love, golf! Be sure to take advantage of being able to practice your golf game as you putt indoors using your new putting surface.